Great comedy appears effortless, even to the point of seeming like a mistake. Of course, comedy is a lot of work, and while some people have a natural sense of comedic timing, the best bits are usually the result of a good deal of work and cooperation between the writer, the comic and the straight man. Jack Benny, in spite of the stinginess of his character, was known for having the best paid writing staff in Hollywood. 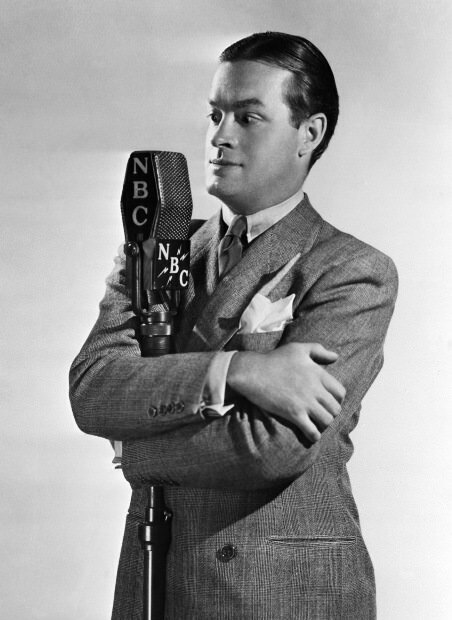 Another well loved comedian who knew the value of great writers was Bob Hope. In 1938, Lever Brothers hired Bob to host The Pepsodent Show. The first thing Bob did was hire eight writers who were paid out of his own $2,500 per week salary. In time, the writing staff grew to fifteen, who were all needed to keep up with Bob's machine gun style of firing off jokes. Eight to fifteen funny guys working together can come up with some really funny stuff, especially with a boss like Bob Hope. However, they can come up with some real stinkers as well. One method to separate the good material from the stinkers was to preview it for a live audience. The Pepsodent Show was a half hour of genuine fun every Tuesday night for listeners. These rare recordings are all just over an hour long. They are obviously some sort of rehearsal or preview recording. Although we the very genuine laughs of an appreciative audience, we also hear a lot of things that we would never hear on broadcast program. There are several instances of Bob and the other players repeating a joke several times, or trying different jokes, to see what gets the best reaction. Naturally, such a format begs for the ad libs that Bob Hope was so well known for. The grueling rehearsals would not have been the only reason that the The Pepsodent Show would have been difficult to work on. In May of 1941, producer Al Capstaff came up with the idea of doing a remote broadcast from March Field, using the servicemen there as a special audience. The show was a hit with the troops, but the concept really resonated with Bob. Bob had been crossing the Atlantic aboard the Queen Mary in September, 1939, when the Nazis invaded Poland, beginning World War Two. He spoke to the captain and volunteered to do a show for the passengers, so Bob had always known the value of a song and a joke during times of stress. Of the 150 or so episodes of the Pepsodent Show broadcast during the War Years, perhaps nine were actually broadcast from their home studio, the rest were on the road, playing for the troops. Be the first to comment on "Bob Hope Pepsodent Auditions"